Snap Inc’s Spectacles made their debut to much surprise and acclaim, but they’ve so far been pretty hard to buy. You could only get one at a physical location in a few major cities, and even then, you might’ve had to wait in a long line to get one from the pop-up vending machines. Now, you can just buy them online for the same $129.99 price. As before, the glasses come in Coral, Black, and Teal colors, and are packed with a yellow charging case. All that being said, you’ll still have to wait; the site shows an expected wait time of two to four weeks. On a related note, the Spectacles site previously had a map showing where vending machines were located, but it now simply links you to the new shopping page. That makes me wonder whether Snapchat is phasing out its vending machines. 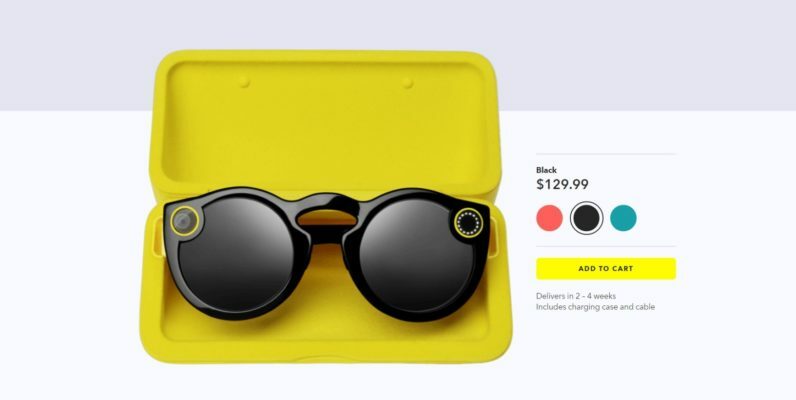 Spectacles marked a new direction for Snap Inc – in fact, they were launched simultaneously with the company’s name change – indicating it needs to grow its portfolio to combat Facebook’s increasingly aggressive apeing. As noted by TechCrunch, Spectacles haven’t exactly made Snap much money yet, but it’s an investment in the company’s future beyond its main app. Making Spectacles more readily accessible is a good step in that direction. Unfortunately, they’re still only available in the US for now, but if you want to grab a pair you can head over to Spectacles.com.